How do you open a conversation with the person you don't know sitting beside you on the bus? What do you say when you see someone you think you'd like to meet? How do you break the ice? This is the job of "small talk". It establishes contact and eases the way forward. It tests to see if there is a possibility of something more. Although often derided for its blandness*, its trite or cliched topics, small talk handled well can become BIG or meaningful talk. If you think about it nearly every important relationship you have outside of your family will have begun with some kind "small" exchange that grew. How did you meet your best friends? Your partner in life, or in business? The ability to initiate conversations confidently and easily is life enhancing. It can open doors to relationships and opportunities we may have never have dreamed were possible. When we allow yourselves to be limited by fear of rejection and self-consciousness we shut down possibilities and settle for the safety of the people and situations we already know. The truth is that most people feel shy and self-conscious in a new setting, and they're grateful when someone takes the initiative to talk to them. Overcoming the temptation to close ourselves off takes a little courage. However the rewards can be extraordinary. 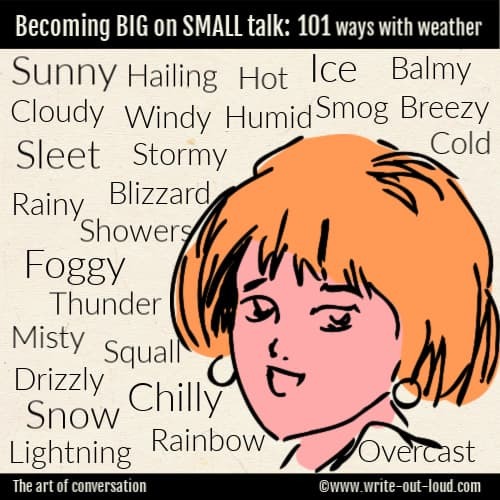 Small talk gets its name because the talk, conversation, covers neutral or safe topics. Talking about the weather, (Very popular and one of the safest topics! ), sports, what's been in the news, work, traffic, seasonal happenings, community events and of course the immediate situation you share: a meeting, supermarket queue, a waiting room, a party ... are neutral subjects. They're subjects you could reasonably expect most people to be able to comment on comfortably. In contrast asking a person you've only just met for the first time whether they believe in God and why, what they think about abortion, or if they have a mortgage is not such a good idea. These are personal topics and not usually discussed with strangers. Opening with one of these will make people feel uncomfortable. You're asking them to reveal too much of themselves to someone they don't know. Given the context the questions are inappropriate. The person on the receiving end of them will likely think you're weird for asking them. How does small talk work? making eye contact and smiling before you approach them. Now use a greeting, then mix your choice of topic with open ended questioning, a sincere compliment and your small talk will grow. The setting is a cafeteria. You're at a conference and it's break time. There are many new people to meet but you would particularly like to talk to the guy who spoke on little blue widgets earlier. They've been a passion of yours for awhile and you're keen to know more. He's by himself over at the water cooler. The open-ended question invites more than a one word answer. When that's coupled with a sincere and appropriate compliment it increases the chances of conversation. Like most new skills the art of opening a conversation with someone you don't know will feel a little forced or awkward at first. The trick is to practice. Use the everyday opportunities that present themselves to refine your approach. Here's an example from what was my Monday to Friday life when I lived in Wellington (the capital city of New Zealand) and took an early morning bus to work. Those connections were an incredibly diverse wonderful group of people. Through them I organised for a class of high school students to visit the New Zealand ballet costume room, found the names of the right people to talk to about help with English for a family of relatively recent immigrants, and discovered that there was a small specialist art-house movie theater in the next suburb to where I lived. What happens if you get brushed off? What happens if you get little more than a grunt type answer? Or if the person you chosen to approach makes it clear by folding their arms and fishing their phone out their pocket that they do not want to talk? It could be any number of things and it's about 99% certain that none of them have anything to do with you. Persevering when someone has made it reasonably clear they don't wish to engage can be perceived as pushy, or even rude. The best and most sensible thing to do is accept that the person doesn't want to engage and move on. Find another person to talk with. Today the biggest barrier to striking up a conversation with someone we don't know is not shyness. It's a phone. People in queues, waiting at bus stops, sitting on a park bench, on a train or on a bus are too busy checking on what their current group of friends and acquaintances are doing to make themselves available to meet new ones. I know because I do it myself. I also know when I put it away I am more likely to get into conversations with the people around me. If you found this information on small talk useful you would probably also like the page it was drawn from on the importance of communication skills. I've laid out 5 easily managed steps to improve them. * Small talk may be about the weather, the latest news, fashion .... However most people will recognize it for what it is: a friendly attempt to establish mutual grounds to open a conversation. If it is successful the initial topic - the weather, the traffic, will soon lead into something more meaningful and interesting for both of you. When you leave a job you'll often be asked to say a few words - to give a farewell speech. And maybe that's the last thing you want to think about and prepare. Because you have so much else to fit in before you go, and so little time to do it all in. Is that you? If you need a farewell speech try my Speech Builder. It will help you prepare a good original speech very quickly. 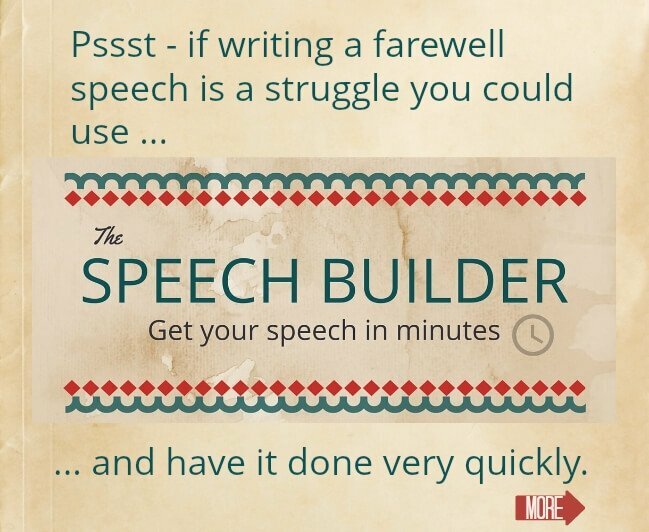 Spend approximately 15 minutes and $9.99 US and you'll have your speech ready to go.